Bungaree, a rural township on the Western Highway and the railway line between Melbourne and Ballarat, is 15 km east of Ballarat. It is thought that the name is derived from an Aboriginal word meaning hut. There was considerable forest in the Bunagree district when it was first settled. The main industries were timber splitting for mineworks and firewood, and farming on the good soil when it was cleared. Numerous settlers took up small farms, some of about 20 acres. Bungaree’s name became immortalised when, at an election speech for the seat of Ballarat East, in 1864, the Orange Lodge candidate addressed the crowd as gentlemen of Ballarat and savages of Bungaree, a deliberate insult to the Irish-Catholic farming community. The meeting erupted into uproar, and ‘Bungaree savages’ became local argot. The Bungaree Road District was formed in 1863 and at about that time Bungaree had three sawmills, a fellmongery and six hotels. Bungaree Shire succeeded the Road District on 27 January 1871. Was just like Noah’s Ark. We had while out at Bungaree. In 1911 Bungaree had a population of about 500 persons and a gradual decline to about 300 had occurred by 1966. The township is set in an agricultural district which has attracted little or no tourism, but some rural/residential settlement. The once volcanic Mount Warrenheip is 5 km south-west of the town. 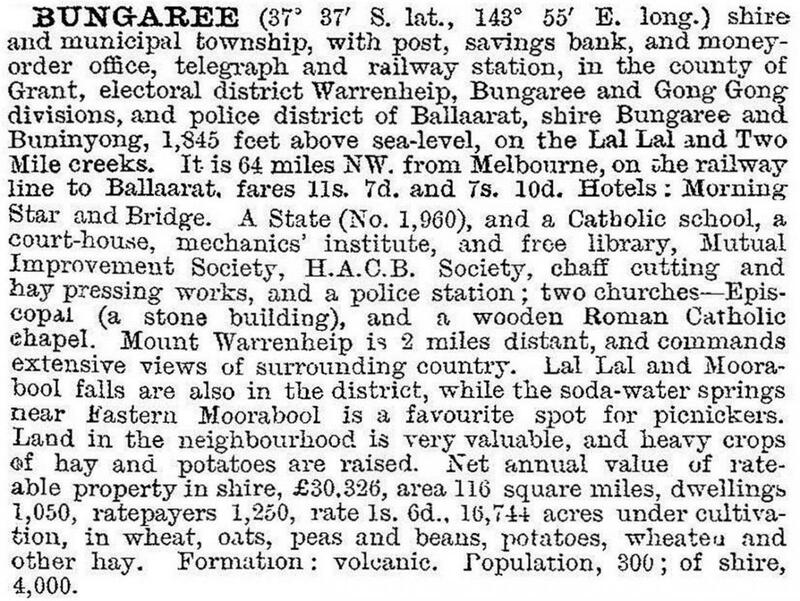 Bungaree has a general store, a hotel, a public hall, a reserve, a football club, Anglican and Catholic churches, a State school (32 pupils, 2014) and mechanics’ institute hall. Its racecourse (1885) had its last meeting in 1961. Bungaree Shire had an area of 228 square kilometres and was located immediately north-east of Ballarat. Its southern boundary was the Western Highway and its eastern boundary adjoined the Wombat Forest and timber districts. The shire’s administrative centre was Leigh Creek. Other towns included Bolwarrah, Bullarook, Wallace and Nerrina. The last mentioned is an urban area in the Ballarat district, and its growth accounted for the shire’s increased population during the 1970s-90s. 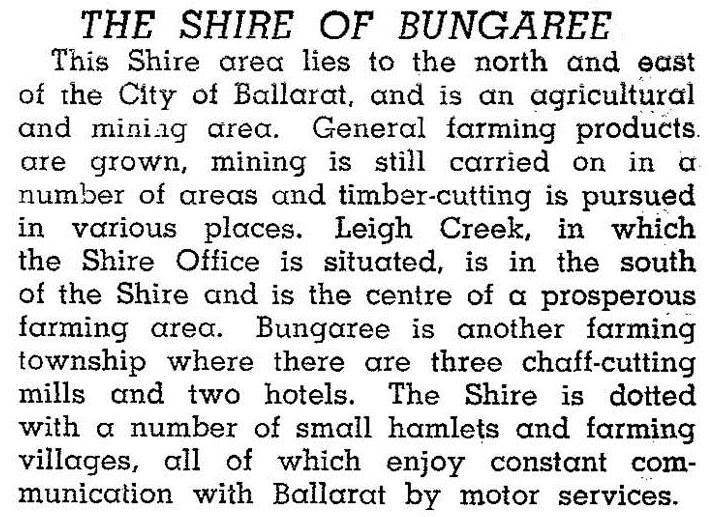 In 1994 Bungaree Shire had 42% of its area used for farming, on which 48,000 sheep and lambs and 6200 cattle were carried. Eleven tonnes of apples and 21,207 tonnes of potatoes were grown. Much of Bungaree Shire was in the Catholic parish of Gordon. Most villages had Catholic churches and in 1900 a large church was constructed at Springbank. It also has a primary school. There are similar establishments in contiguous districts at Dunnstown (to the south) and at Gordon (to the east). On 6 May 1994, the urban part of Bungaree Shire was united with Ballarat city and the rural part was united with Moorabool Shire.